Gone are the days of empty flights and abundant overhead storage space. If you’re one of the unlucky people who boards late, your luggage won’t have space in the overhead bin. Really! Smaller planes have smaller overhead bins. That means that max size “carry-on luggage” doesn’t always fit, especially hardside luggage and carry-ons with wheels. Rumor has it that the major airlines will be downsizing the carry-on size limits and/or enforcing them with penalties. While I understand passengers’ frustrations with baggage fees, oversized carry-ons have become a problem that slows loading and delays flights. It denies some passengers the opportunity to use carry-on space. If they’re going to cram us in like sardines, the luggage allowance needs to fit the space as well. 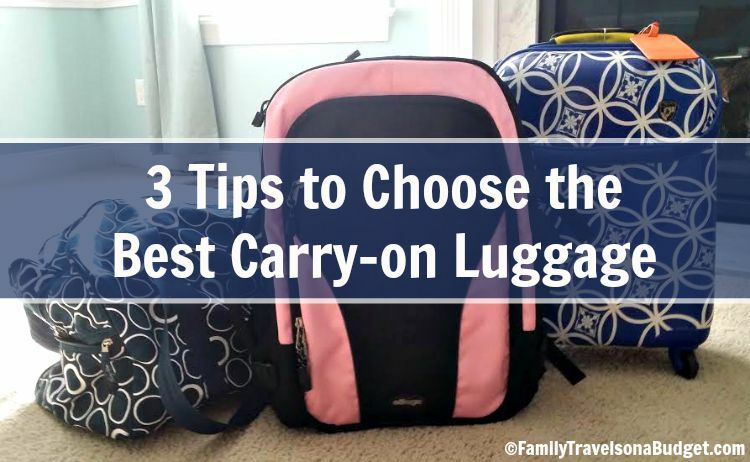 With restrictions and changes, it’s more important than ever to select the right carry-on luggage for your travel needs. 1. Know luggage size limits — and follow them. While it’s fairly standard, Southwest has a different size requirement. In the past, wheels and handles didn’t matter, but now they really do! United: Maximum dimensions for a carry-on bag are 9 inches x 14 inches x 22 inches (22 cm x 35 cm x 56 cm), including handles and wheels. 2. Consider the items you need to carry. When I travel for business, I need my computer, good camera and allergy medications/epi-pen. I just can’t travel without them. My favorite carry-on, a blue hardside bag with with wheels, handle and dedicated laptop space, fits these items and clothes for 3 days. I was happy with my purchase. Then, three trips in a row, there was no space in the overhead bins for my bag. EEK! The airline didn’t penalize me (I follow rules very well), but they insisted that I had to gate-check my bag. For me, being separated from computer and camera knowing the bag would be “handled” like a toddler’s toy tossed across the room, I was not thrilled. Every time, I pulled my computer from the carry-on and then gave them my bag. It all worked out for me, but not comfortably. My solution is not ideal, but I now carry my computer, camera and meds in my personal bag (very heavy shoulder bag that I can slide under the seat) and use my carry-on for clothes only. Lesson learned: Carry-ons for the overhead bin probably won’t make it to the overhead bin! Pack accordingly. Soft side/Hard side: Hardside luggage provides structure and protection, especially in bad weather. Softside luggage is more flexible. Wheels/No wheels: If carrying a bag through the airport is difficult, wheeled luggage is a better choice. Some hybrid bags (hardside back with soft side top) offer wheels. The drawback with wheels is they may make the bag too large for a carry-on. Also, luggage space is lost to the wheel mechanism and handle. Weight of the bag: The lighter the luggage, the lighter the load overall. When comparing luggage, consider the added weight of the bag. Interestingly, my soft side bag weighs almost a pound more than my hard side, wheeled bag. Newer technology means hard side bags are lighter than they used to be. Compartments/Organization: Today’s luggage can be super-structured, with features like a laptop sleeve and separate space for shoes. Other bags are more simple, letting the user decide how to use the space. Consider the features, but don’t be swayed by the bells and whistles. If you don’t need them, you might find a simpler bag for less. Durability: I’m a frugal traveler, so purchasing the cheapest bag initially seems smart, but that’s not always true. My current bags have been with me for several years. They show signs of travel, scuff marks and scratches, but they are as strong as ever. There are no rips, tears or cracks in my durable luggage. Price does not equal quality, though. My bags fall into the mid-price range. Read consumer ratings: Reviews are tricky. They’re subjective. Over time, though, they’ll even out. If many people complain about a particular feature, probably that bag has some flaws. When you’ve narrowed down your search to a few bags, check consumer ratings to see if one stands out. Look for deals! Retailers want your business, and the deals are out there, if you look for them. Never pay full-price for a piece of luggage. That’s how I do it. What factors matter to you in luggage? Do you have a tried and true method to survive carry-on limits? Join us on Facebook or comment here to share your best luggage selection tips. Mobility is a feature you should consider whenever buying a bag. Since airports can be busy and crowded, you’ll want to push and pull your bag easily to prevent disturbing other people. Having carry on luggage with wheels is important as well. Some bags have 2 wheels while others have 4. It is better to choose a bag with 4 wheels that are in line and move smoothly. You can even easily drag your bag 360 degrees if you find one with the perfect wheels. I took my family on a trip to Oregon this past summer. We went for two weeks and so that was a lot of luggage what with it being me, my husband, our four kids, and one of our nieces. It was a great trip but it really helped to have the right luggage. We had always just thrown things into backpacks but this year we decided to do it right. We got custom made bags with our favorite sports team’s logo on it so that it would be recognizable at luggage claim. I am really pleased with the way that we did things and it was less stressful. I’m so glad you had a great, organized, semi-stressfree trip!